Fashion mobile phone has not written a number of requirements that almost always appear. Only display a high quality, glossy material, strange mechanism, the camera and the last being a warm touch interface. Then, if the new fashion phone from Samsung has all that. Answered yes. 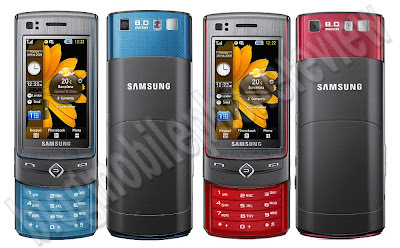 Under the name Ultra Touch, referred to as the S8300 one of the first Samsung mobile phone for this group. Suggests that while the Samsung Ultra Touch is not just mobile phone fashion. Then, as if the actual Touch Ultra? S8300 is a slider phone with a theme. Although the screen is a touch, the phone is also a keypad array. Only alphanumeric keypad, the button without the key direction. So the key keypad is used only to facilitate the process of typing a number, sms or email. Meanwhile, efforts to control the direction to use the touch screen. Place a normal D-pad is laid, is used to put the key back. Thus when the slider is closed, iPhone-like interface. Ultra products such as tools, S8300 also be made thinner. At least for the size of mobile phone with slider design and touch the sail, the Touch Ultra slim and elegant look. The effect, not the memory card can be made hot swap. Place side by side returned home with a SIM card. Thus, we must turn off the phone and pull out the battery to install. Second is the combined effect of hole charger, and audio data in one hole. It is so, type the hole using a more typical small and thin phone Ultra. Mobile phone wrapping material made to look luxurious. It's part doff, glossy and have also met a metallic fiber. Options available colors, red and blue, a color that is only visible on the keypad and the back of the screen (more hidden). The color black dominated. Either because more black or emit luxury is one of the typical Samsung phone fashion. Touch screen that is brought Ultra Touch screen with new technology. Name its AMOLED stands for Active Matrix Organic Light Emiting diode. In other words, this screen is a OLED screen with the same nature with the TFT (active matrix). However, with cheaper production costs and power consumption is lower. Then how about the quality? You are familiar with the conventional TFT LCD screen may be the screen is too dark. Perhaps this is due to light in the AMOLED screen which is only effective in the colored section. The rest, the other screen will not be given so that the light appears dark. This general nature of OLED. However, with effect 16 million colors, wide QVGA resolution (240 x 400 pixels) and active matrix, then the color will look brighter and moves from one image to another image with the visible. Matter which side is better than the view, seems still a bit under the AMOLED TFT LCD usual. At least take time for Samsung continued to develop this type of display such as this in order to replace the parallel and the role of the conventional TFT screen. As information, Samsung is also applying this technology in the LCD monitor and television products in the latest HD technology, which has (HigHT Definition). Meanwhile, the menu interface using the S8300 back TouchWiz. Still remember the interface brought OMNIA or Samsung F400? Touch interface that involve a number of widgets used in this re-Ultra Touch. In addition to a number of functions in the array, we also serve on the 36 widgets for different purposes. In the default condition, this widget is hidden in the drop down menu located on the left of the screen. You can move it to the main screen with a shove-it. A number of widgets may be you need. Among them are Facebook and Friendster. Reminder In addition to a diet and not smoking. Latest Samsung mobile phones often bring a digital camera which is very high quality. Samsung S8300 camera is also made interesting. Complete with a number of software and hardware. On the hardware, S8300 brings the flash type dual LED. While the software is almost all of the settings in the camera taken by a professional camera phone. Unfortunately, that type of setting is provided so little known. Yet the habit, we can manage all things related to the shooting. Function keys that are available here are: face detection, antishake, smile shot, macro shot. We can also manually set the ISO in accordance with our needs. The result is quite satisfactory, taking pictures in the room no longer require additional light and need not fear the excess light. Dual LED flash used which are sufficient for a short distance. Some camera phones that bring the type of Xenon flash, also some phones that use the LED lights would leave the impression that light is quite bright on the object during a shooting range. Similarly when invited to perpetuate the object outside the room. Each object that caught the lens appears sharp. Both in the focus point and the point farthest from the point of focus appear real. This feature is deliberately separate from the ability of a camera phone. Ability record video in mp4 format with a resolution of 720 x 480 pixels is not less satisfactory when compared with the capacity for taking a camera phone. Video is recorded in the resolution of 30 fps with the results of the fine, without a broken image and that still sharp. Provided that we do not move the camera too extreme. Resolution 720 x 480 resolution is big enough to display on television screen. As equally we know, this resolution is included in the family for the High-definition HD video streaming, such as Youtube HD. Besides, does not want to lose from LG, S8300 camera also offers video resolution record in the slow movement (120 fps) and fast twitch (16x normal speed). As usual, again using the Samsung Mobile Netfornt with access to its browser. This browser is able to display wap page, mobile web and full web without problems. Akselerometer with technology that is inside, the view orientation of the phone browser you can change the landscape with just a play phone. Touch interface that applies here is not sophisticated like iPhone, but it is quite good, at least, to reduce one of the key press on the link that is not our purpose. However, when the input text, we will be taken to a new page with a special text input display virtual alphanumeric keypad. Simply making. Shortcut to the Google services (mail, search and GoogleMap) also available. However, the process of browsing to use the default browser. Realizing that the input text through a virtual keypad will may cause difficulties, S8300 also provides key keypad. This seems to be more time-saving. Just need to open the slider so that the keypad is displayed. The data transfer speeds that are supported to reach 7.2 Mbps for downloads (HSDPA). However, the speed problem will depend on the condition of service that we can use the service. S8300 also provides multimedia features. Among them is the music player, divx video player, FM radio. They complement each other with good enough quality. Including support A2DP for listening to audio via a Bluetooth headset (except radio) and also the choice of 5.1 audio channels. S8300 is also equipped with a GPS receiver. In addition to navigation, this feature is also integrated with a camera for geotagging. 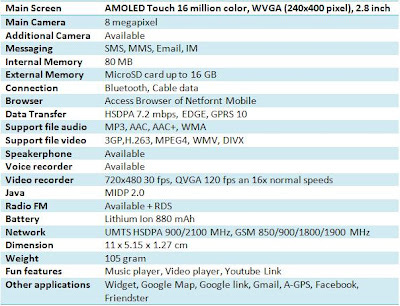 Not surprising if Ultra Touch only provided with a battery capacity of 8880 mAh. Power consumption is low on the screen (the nature of the AMOLED) and power management on the side of the screen that is able to reduce the effective use of most resources. Not surprisingly also, even though the network and HSDPA enabled a number of features to run optimally. This phone can survive for 2 days in one charging. Ultra Touch can be defined freely slim Samsung mobile phone that have a Touch User Interface. All terms of a mobile phone owned fashion product. AMOLED screen, slim design, the camera is that some of the positive things that can be obtained from this product. Unfortunately, besides the price is still relatively expensive and lack of support for WiFi, Touch UI that is used is still unsatisfactory. Mobile phone wrapping material made to look luxurious. It's part doff, glossy and have also met a metallic fiber. Bangor Co Down that has been described as the most comprehensive health and beauty salon website to be published to the Internet. Start your journey to paradise by using the navigation to the left or following the links below.Bangor Co Down.